Design and build modern, robust & user-friendly web applications real fast with our clean and customizable admin dashboard templates that has a huge collection of pre-built widgets and plugins! 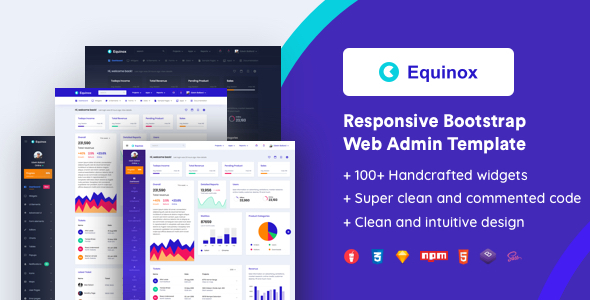 Equinox is a multipurpose admin template Bootstrap template that is designed based on jQuery, HTML5, CSS, SASS, and the latest version of the Bootstrap framework. The Angular version of the JustDo Bootstrap admin template is built by using Bootstrap, HTML5, CSS, SASS, and the Angular 7 framework. The responsive, multi-purpose, and feature-rich HiliteUI Bootstrap admin template is built with Bootstrap 4 Framework, HTML5, CSS and JQuery. 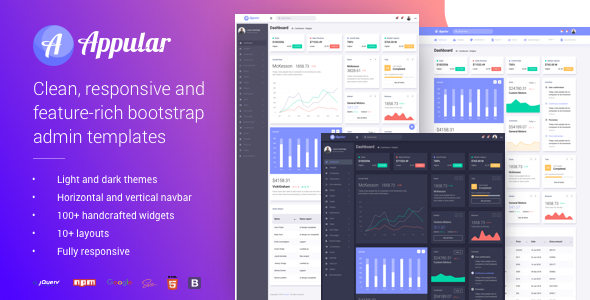 DatavizUI is a feature-rich, user-friendly, and highly responsive Bootstrap admin template that packs an extensive collection of handy tools and useful components. If you are looking for a feature-rich, user-friendly, and highly responsive Bootstrap admin template, then you will instantly fall in love with the Appular Bootstrap admin template. JustDo Admin is a full featured, multipurpose, premium bootstrap admin template built with Bootstrap 4 Framework, HTML5, CSS and JQuery. Fily Admin is a full featured, multipurpose, premium bootstrap admin template built with Bootstrap 4 Framework, HTML5, CSS and JQuery. Silica Admin is a full featured, multipurpose, premium bootstrap admin template built with Bootstrap 4 Framework, HTML5, CSS and JQuery. BogyUI is a clean admin template based on Bootstrap 4 with horizontal and vertical layouts, dark and light themes, and other variations. Boardster is a Bootstrap 4 premium admin template with a very clean design and variety of layouts and color themes. 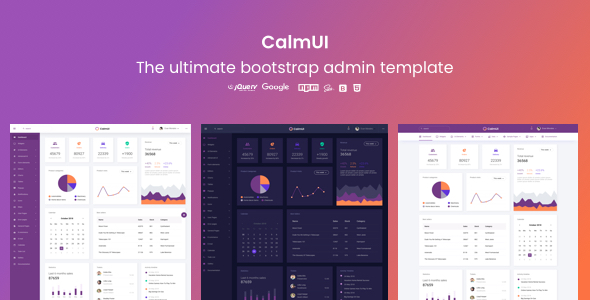 CalmUI is a Bootstrap 4 premium admin template with a very clean design and variety of layouts and color themes. 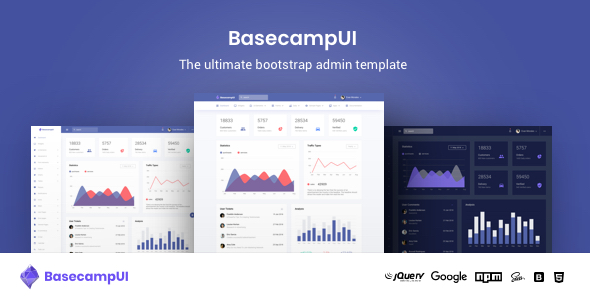 BasecampUI is a Bootstrap 4 premium admin template and UI kit with a wide choice of layouts and color themes to choose from. 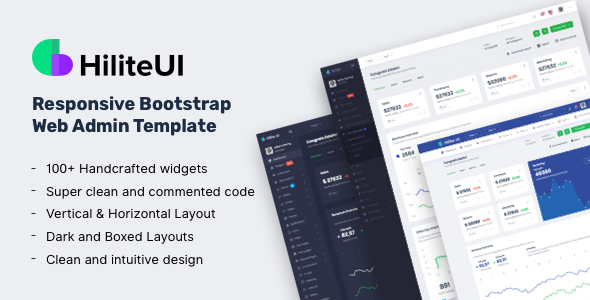 Serein admin is a clean template UI kit made with Bootstrap 4 and contains a wide choice of layouts, light/dark theme, sample widgets and much more. 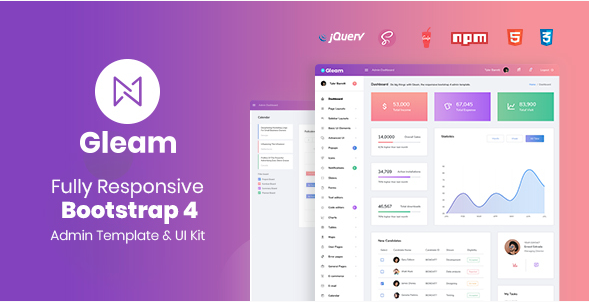 FlareUI Admin is a full featured, multipurpose, premium bootstrap admin template built with Bootstrap 4 Framework, HTML5, CSS and JQuery. 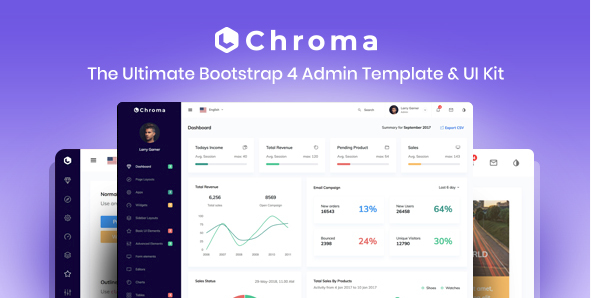 Chroma Admin is a full featured, multipurpose, premium bootstrap admin template built with Bootstrap 4 Framework, HTML5, CSS and JQuery. Gleam Admin is a full featured, multipurpose, premium bootstrap admin template built with Bootstrap 4 Framework, HTML5, CSS and JQuery. Radiant Admin is a full featured, multipurpose, premium bootstrap admin template built with Bootstrap 4 Framework, HTML5, CSS and JQuery. PearlUI Admin is a full featured, multipurpose, premium bootstrap admin template built with Bootstrap 4 Framework, HTML5, CSS and JQuery. 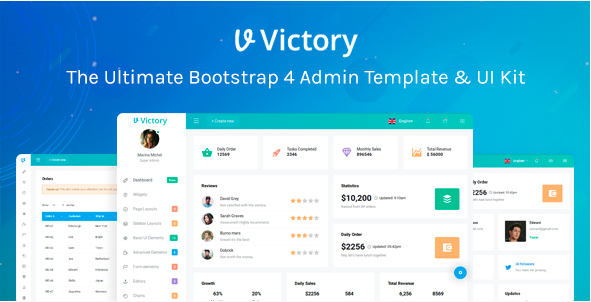 Victory Admin is a full featured, multipurpose, premium bootstrap admin template built with Bootstrap 4 Framework, HTML5, CSS and JQuery. Salt Admin is a fully responsive bootstrap admin template that comes with a huge collection of reusable UI components. 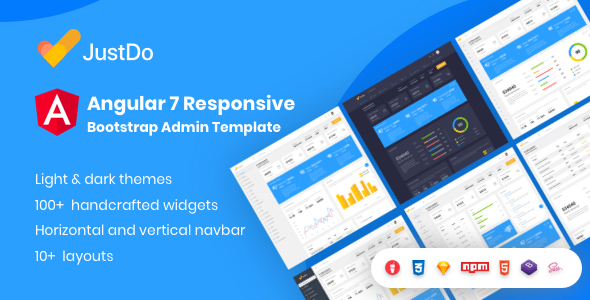 Bootstrap 4 Admin Template with a variety of layouts and widgets. Wunder Admin Template is built on top of Bootstrap 4 and follows Google material design guidelines. A good pick for developing responsive, mobile first web applications. Inspire, an amazing template built on top of Bootstrap 4, will help you developing responsive, mobile first projects on the web. This Admin Template is built on top of Bootstrap 3, and has great UI/UX. Give your web application a very unique look. 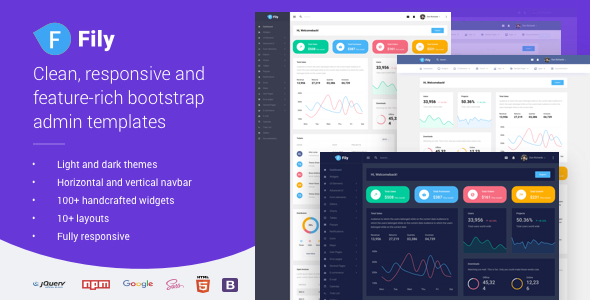 A highly rated Bootstrap 3 based admin template, Turbo follows Google material design guidelines. I’m very happy with this theme – it’s very easy to use/implement/customise and beautifully coded – a job very well done by UrbanUI. In addition, the support has been absolutely first rate – found a couple of minor bugs which were squashed in record time. I had a trouble with the theme, the team answered me in less than a day. They contacted me again regarding this issue a few days later to notice me a new version. The support is really high quality, and the team is helpful and friendly. The theme itself is nice and clean, a great start-up for a new project. It comes with a detailed documentation which is a real advantage. Excellent template with a lot of elements. Faced some issue with bootstrap dropdown element what was resolved with customer support in 1 day. Pleasure to be working with. Thank you.